The Society of Bibliophiles has had a superb inaugural year, with visits to Lambeth Palace Library, Peterhouse College in Cambridge and the Institute of Historical Research, to name but a few. Now in its second year, the society has an exciting programme of events lined up; including a visit to the London Library, a private view of Bonhams’ spring auction and a dinner-talk at the Athenaeum Club by Mark Samuels Lasner. Please have a look at our blog for the full events listings. We’re open to all and aim to provide an opportunity for those who are interested in book-collecting – whether it’s rare books, comics, or classic Penguins – to meet up with like-minded people. Meetings and visits will be held throughout the academic year and the full programme of events will be announced shortly. 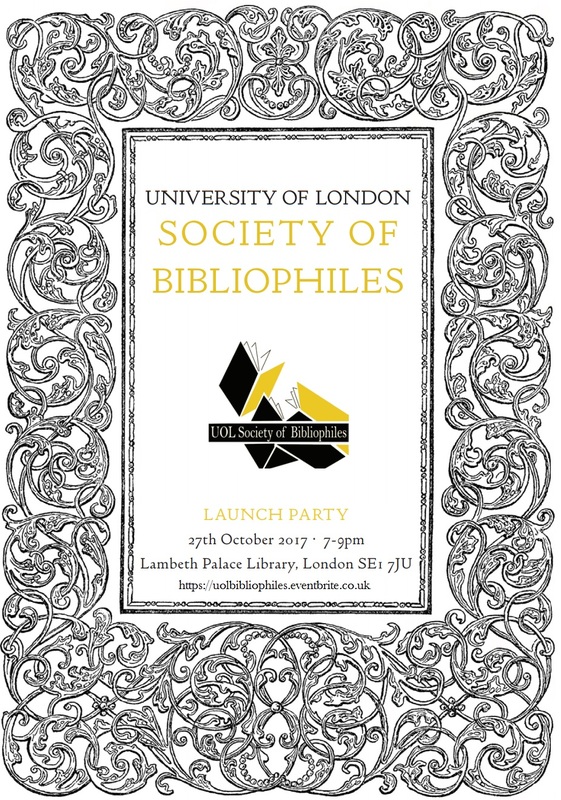 We would be delighted if you’d join us on Friday 27th October at Lambeth Palace Library from 7-9pm for a glass of wine to celebrate the second year of this new venture. Lambeth Palace Library, Lambeth Palace Rd, Lambeth, London SE1 7JU. Category: Archived Events, Archived Reading Groups Tags: Bonhams, English and Humanities, Lambeth Palace, London Society of Bibliophiles, Society of Bibliophiles by ubashe02.